It’s that time of year again, Back to School time! If you’ve got little ones heading off to school, then this giveaway is for you! 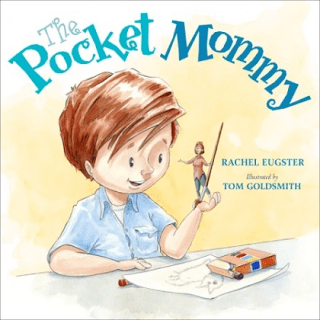 We’ve partnered with Random House to give away 10 copies of “The Pocket Mommy”. Saying goodbye to Mom at the kindergarten door can be tough. Samuel hates it and wishes he could have a tiny, pocket-sized mommy to carry around with him all day. His mom slips a pretend mommy into his pocket, and when she comes to life, Samuel is delighted . .. at first. But he soon discovers that having a mom along in kindergarten isn’t as much fun as he thought it would be. Sure, she helps him remember the words to songs and keeps him company. But she also rearranges the bookshelf, corrects his artwork, and tries to clean out the guinea pig cage—all with disastrous (and comic) results. An energetic romp with a sweet core, The Pocket Mommy follows one little boy as he navigates the age-old conflict between the comfort of the familiar and the joy of letting go.